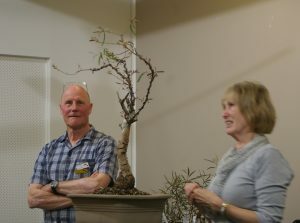 Tree and shrub species of the Mallee with potential for bonsai was the main topic for the October club meeting following the AGM, although this was preceded by a discussion of a couple of trees which members brought in for display and discussion. First for review was a River Red Gum, Euc camaldulensis, which had been collected by Val at the Club dig day near Mt Franklin earlier in the year. The tree has survived the excavation, and is showing good promise, with plenty of new leaf and branch shoots. 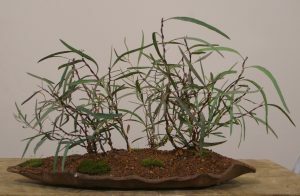 The second tree reviewed was Chris’ Corymbia citriodora (? 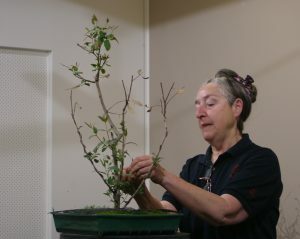 ), which had a good range of new leaf and branch shoots, ad plenty of interesting options for future development. 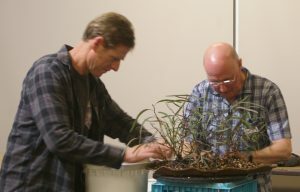 The Mallee presentation then included a demonstration of establishing a group planting of young Green Mallee (Eucalyptus viridis) trees by Quentin, assisted by Matt, intended to present a view of a stand of mallee eucalypts as they could appear in nature, even though as young plants needing further development. 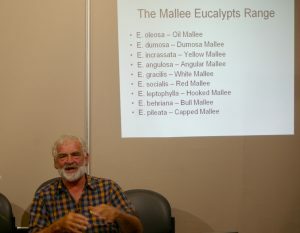 While the planting demonstration continued, Kevin presented a discussion on the Mallee region of NW Victoria and adjoining areas of SW NSW, and eastern South Australia, outlining the diversity of eucalypts and other key species of the region, showing photos of the trees in the wild, and what they look like as younger trees being developed for future bonsai.